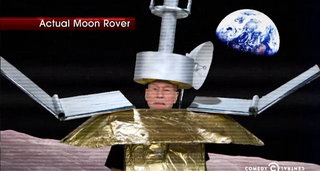 China's Jade Rabbit (Yutu) lunar rover has broken down on the moon, and Sir Patrick Stewart has employed his thespian talents to pay tribute to the plucky robot explorer. On last night's Daily Show, Stewart dressed up as Jade Rabbit and bade a (goofy) bittersweet farewell to humanity. If you want to skip ahead to Patrick Stewart's portion of the segment, he pops up around the five minute mark. He does his best dramatic reading of what the official Xinhua News Agency called the rover's final "diary entry" before shutting down for the lunar night while repairs are attempted. Sleep well, Jade Rabbit. Hopefully this isn't goodbye forever. After all, we need to see Patrick Stewart dressed in that costume again.